I'm happy to announce that I will be continuing as one of the FAL hosts and would like to introduce you to the full line up as well as the schedule so you can start planning your participation. You can find out more on my permanent 2019 FAL page found at the top or click HERE. 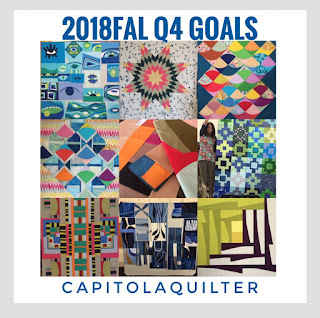 Just a reminder that 2018 isn't quite over yet and the Q4 FAL link up will open 1/1/2019 to 01/09/2019 so check back soon. 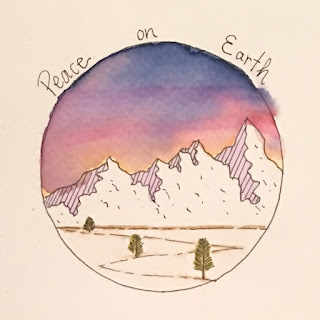 Blogging has been taking a backseat to Instagram for a while now but thankfully I am still trekking ahead and if you're reading this thanks for being along for the ride! 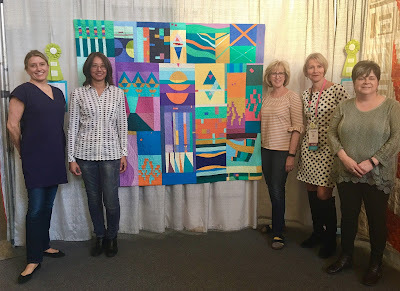 Pretty sure that attending QuiltCon is going to top my favorite chart hands down, every time, no matter what but the fact that I got to display my quilt and received a second place ribbon makes it even more so. 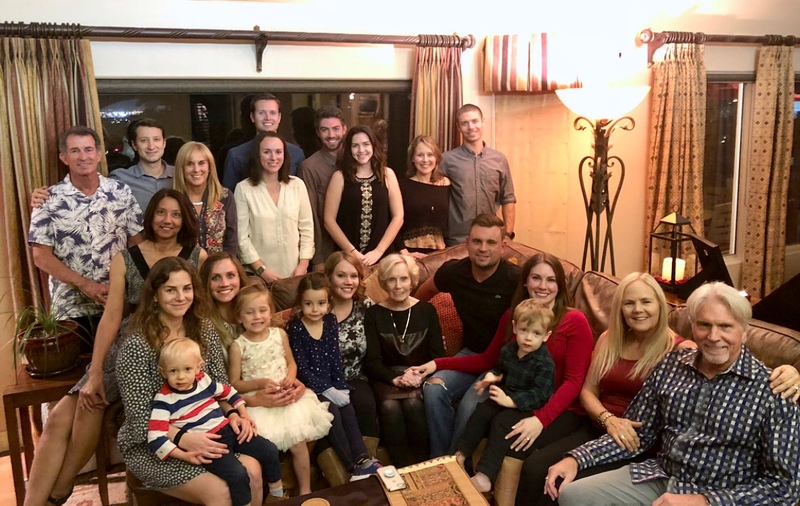 I'm pleased to have included a lot of pictures from the trip. Having my quilt featured in the Gallery of Curated Quilts was definitely a highlight as was the opportunity to teach a workshop. Swapping with my local guild mates is something that I never miss participating in and enjoy. 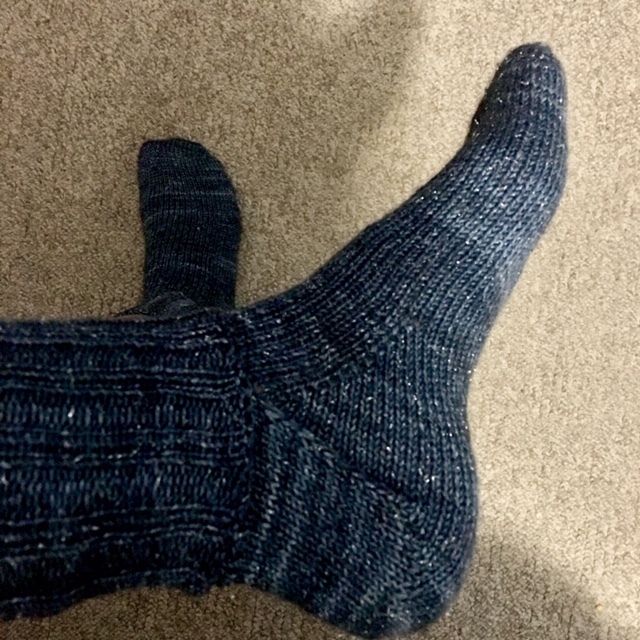 I was really pleased with what I made, what I received and the photo shoot of both. 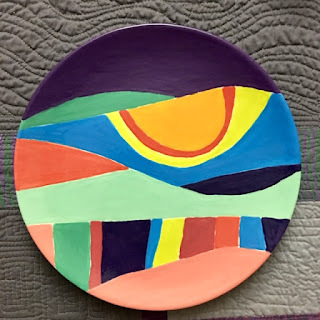 One main reason that I started blogging was to capture a moment in hopes of being transported back when reading it again later. Watching my granddaughter grow from a baby to a kid in a blink really emphasizes just how quickly time passes. 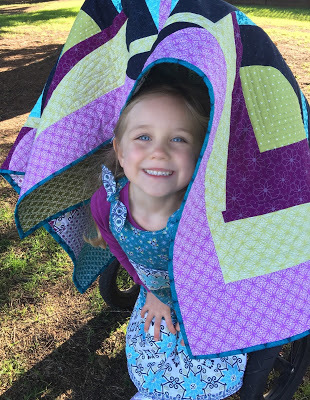 We had the best time with this drop-everything-and-sew marathon project for her BFF's birthday present. Letting her take the creative lead and witnessing deep hearted enthusiasm that never faltered was something that I will treasure. By far the most comments but that's to be expected when a fabric giveaway is up for grabs. That statistic is only part of why I chose this one for my top five. Mostly it was because the original design is one that I'm very proud of, secondly I (successfully) made a garment and lastly it's all documented with pictures from two separate photo shoot sessions which is a real rarity. I've entered this quilt in our local show in February and am calling it "Surf Crusade" after much consideration and crowd sourcing. 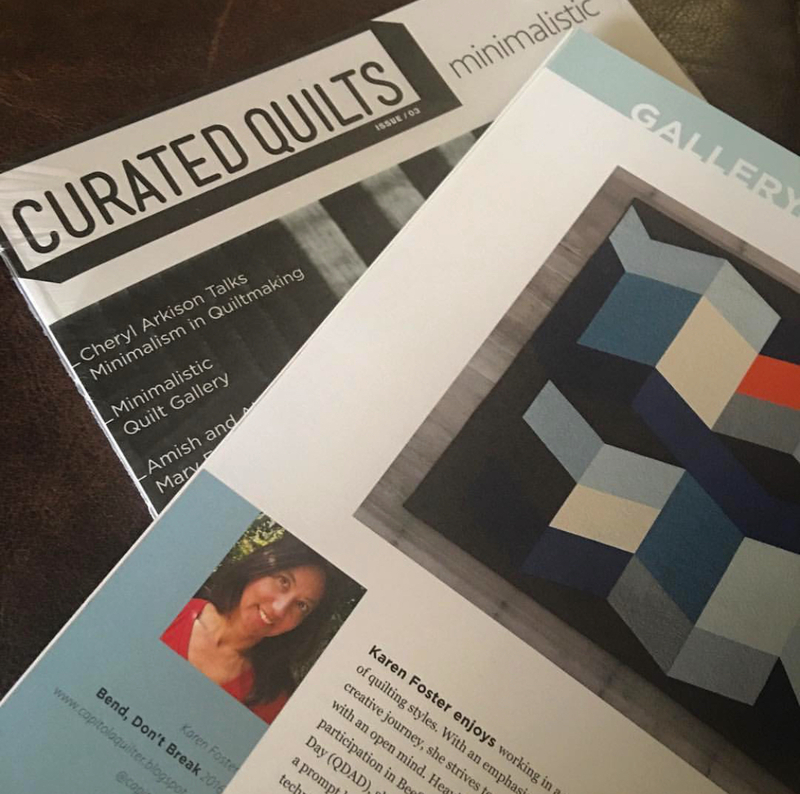 I'll be in Nashville for QuiltCon but if you're local to Santa Cruz and can attend I hope you enjoy seeing it in person. 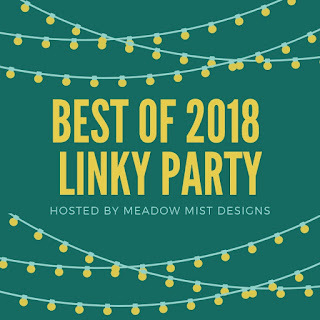 Be sure to check out the linky party and join in if you're a blogger too. 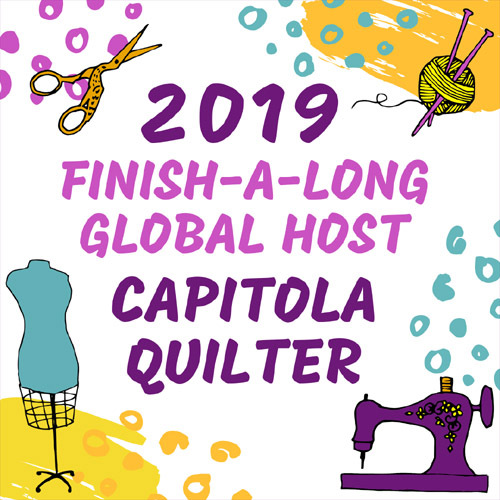 I've been up to my eyeballs trying to finish the top from 2017 BeeSewcial (originally blogged here) hoping to check another 2018 FAL Q4 goal off the list. 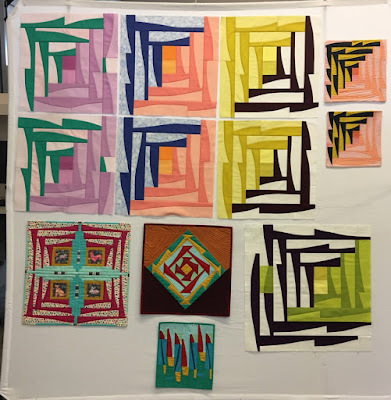 Although I made progress with two new blocks sewn to add to the collection from my bee mates and a final (revised) layout committed to, it will definitely roll over to 2019. 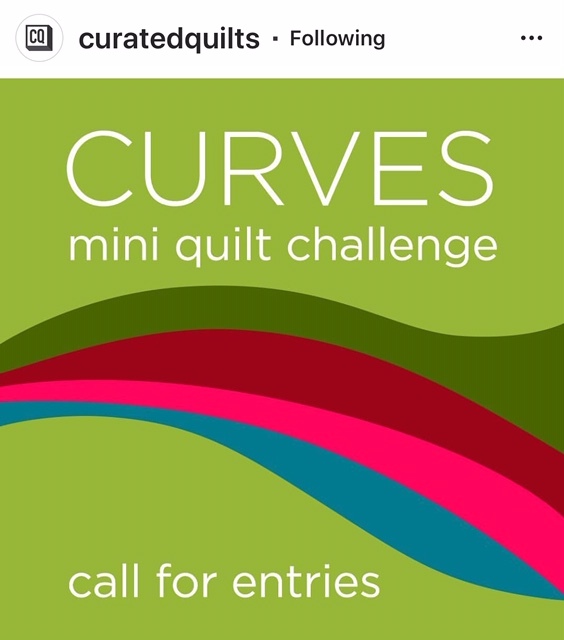 So, I took a break and made an Eye Inspired entry for Curated Quilts curves mini quilt challenge. 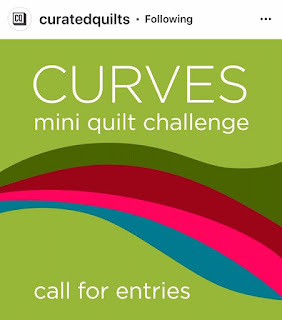 When I saw the call for entries, immediately I knew I wanted to participate. Having missed out on making one for the Improv theme, I decided to slip in a little spill over and came up with a finish that I'm really proud of. Even though the it isn't a requirement to include the entire palette, I wanted to capture the essence of the color story as much as possible. Keeping with the Curve (and improv) spirit, I chose to quilt organically with contrasting thread which is always a bit terrifying especially when the clean slate stage of the top is flat and graphic. 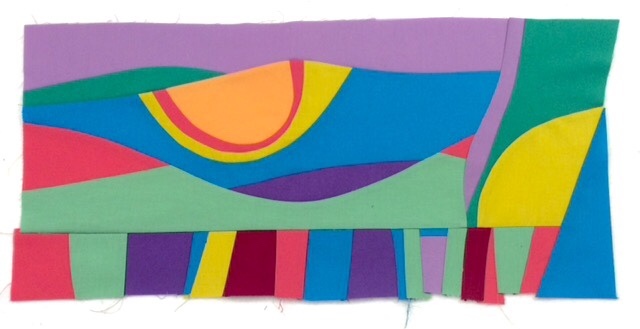 Changing colors and burying thread is not a favorite task. I ended up using only two spools even though the others matched well it felt like that many changes would feel overworked and distracting. Staying true to the design-as-you-go approach, I let the lines evolve with some intentional repeated treatment. It's not exactly uniform but again, the idea was to enhance and not detract from the piecing composition. 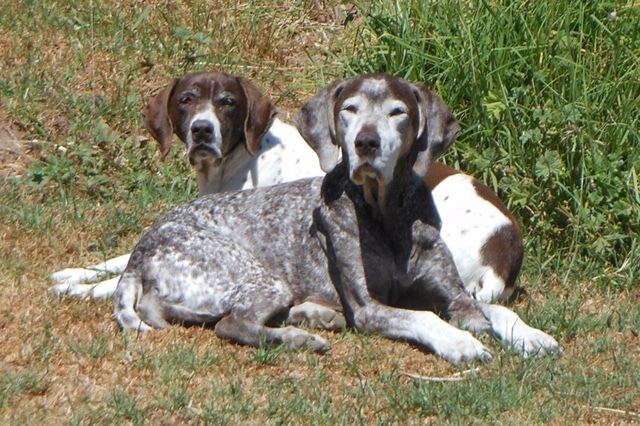 Linking up my finish with fingers crossed that it is picked for publication. Start to finish feels good. 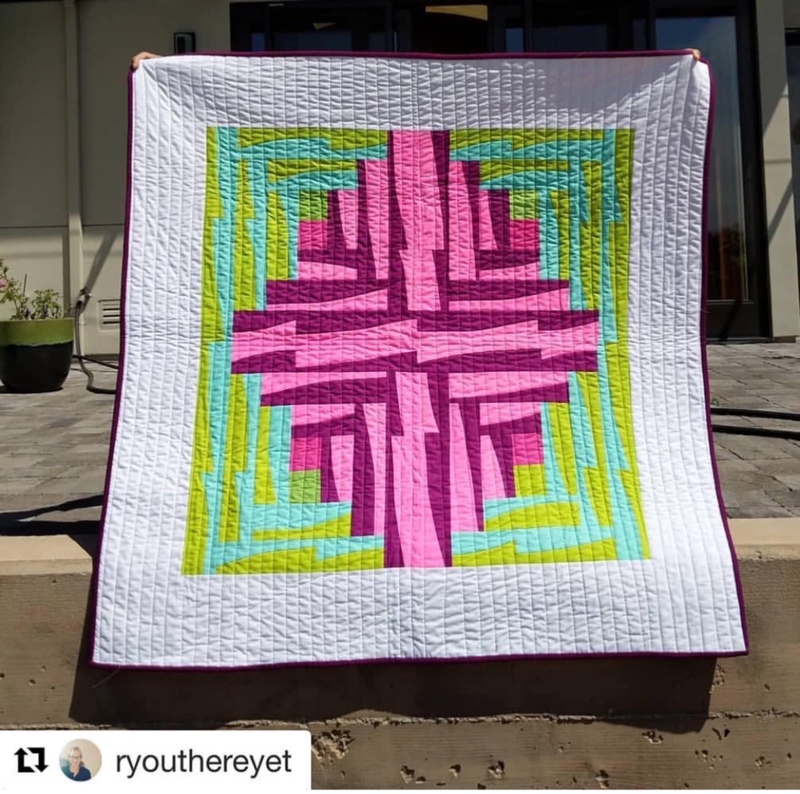 To contrast the curves I found the most perfect striped fabric in my stash for the single fold binding and was super flattered when designer Jennifer Paganelli made this comment on Instagram "I just want to say this quilt is hugely inspirational and I love seeing my stripe!! ❤️❤️❤️"
Adding the moment I woke up and read it to my fangirl archive with a big grin. 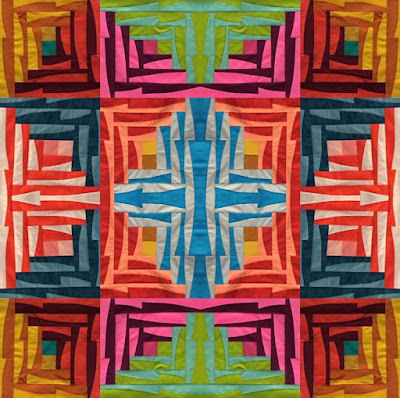 As the year comes to a close, one of the fun things to check in on is the mosaic generated by an app called Best Nine. 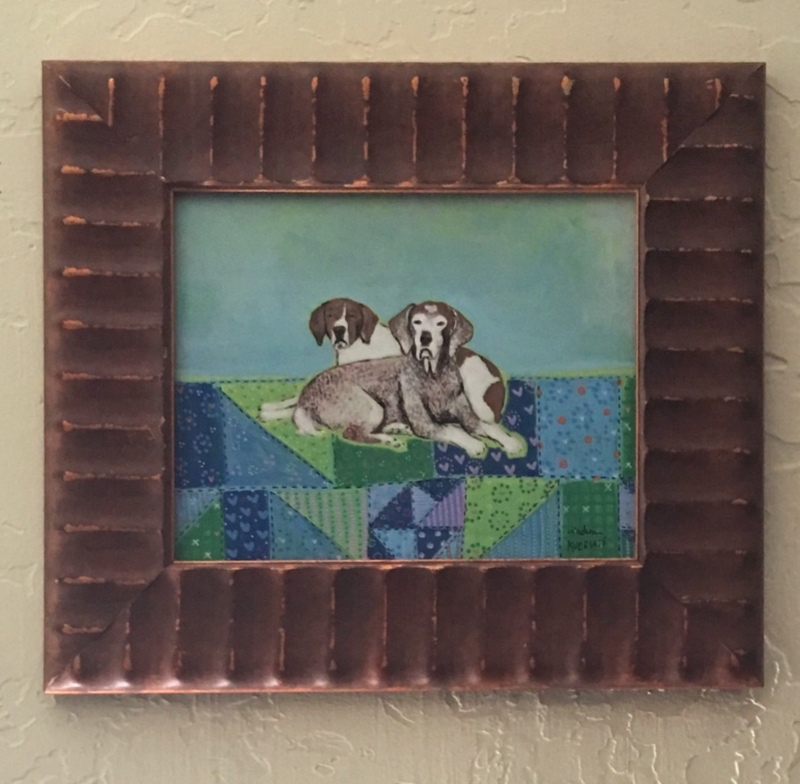 I learned a trick this year to eliminate duplicates by temporarily archiving the post and restoring it after you run the report. No surprise that both of the bee quilts showed up twice. Someone also started a more specific hashtag #quilterstopnine as a better filter for seeing what other makers have shared. We finally installed the No See Ums hanging system to replace our headboard. 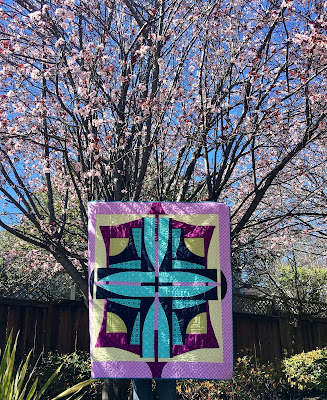 This picture from last week was the duplicate but I decided to include the version of me posing with my quilt and ribbon instead because that moment (and honor) was really special. 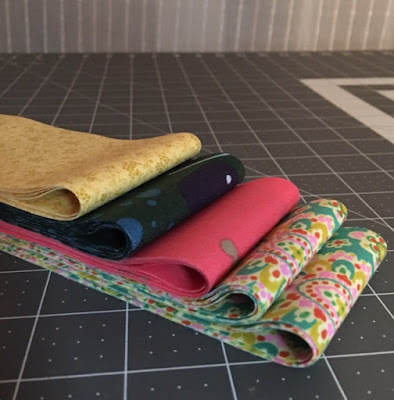 We had our secret fabric swap exchange at the December guild meeting and I received this gorgeous FQ bundle of Manchester and Aurifil thread from Isabelle. Isn't the palette so ME, as if personally curated? A guild mate commented after that she thought I'd picked my own package. 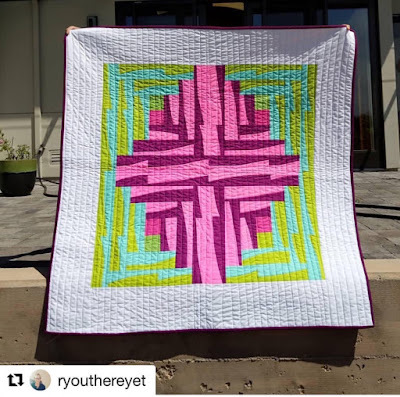 If I make a pillow for the bed, it would fit right in with the one from my friend Kelly. Plans are to change the quilt out every so often. Not weekly, but maybe monthly or quarterly. The optimal size for the space is 60ish square. 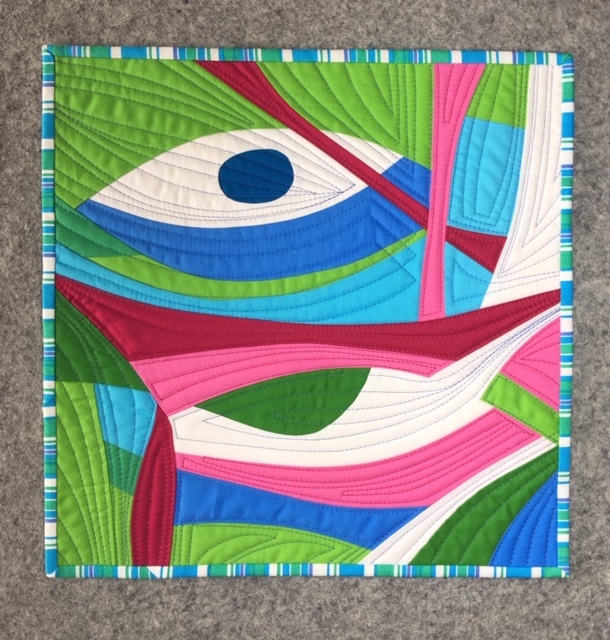 I'm making progress on my Eyes quilt with that target in mind. It feels like I haven't sewn in forever! Brushing off the Bah Humbug the best that I can. As the year winds down and I begin to think about writing a 2018 recap, it's become quite apparent that much of the highlights have yet to be blogged about. Most has been shared on Instagram but to chronicle my quilty journey more permanently, I am going to try to blast through some posts here before the calendar flips even if they are after the fact and not necessarily in order! 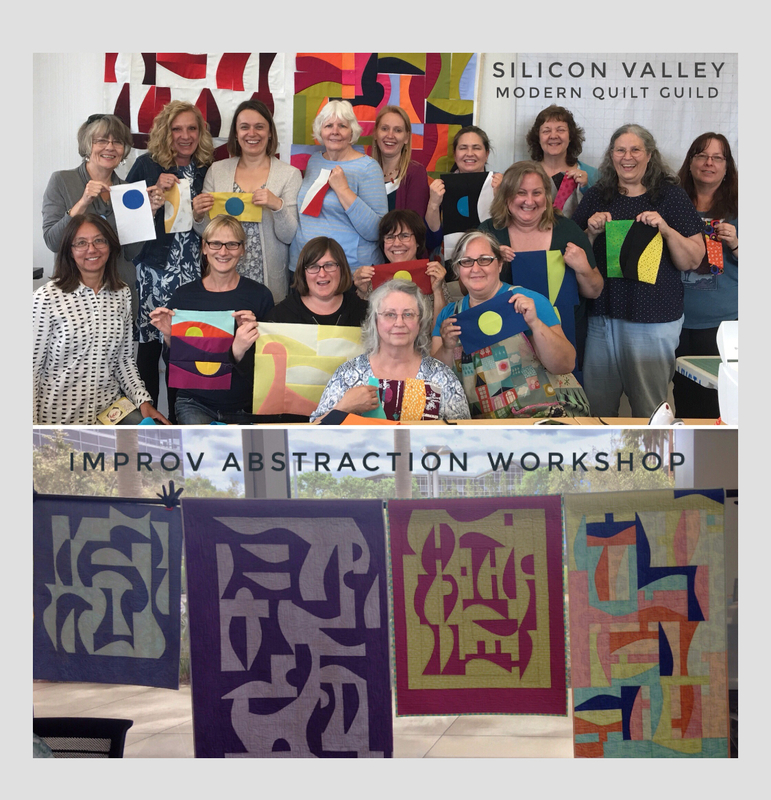 Flashback to Summer: August's Improv Abstraction Log Cabin Workshop. Playing around with traditional layout options with a scrappy combination of student blocks was entertaining. Mixing a wide variety of colors and four repeated blocks feels doable considering most attendees finished two 18" blocks by days end. Of course i said yes when I was asked by our SBAMQG president to develop a new workshop based on the Improv Abstraction Log Cabin mini that was published in Curated Quilts gallery and teach it to our members. I love the painterly quality that Marylene achieved and her black sliver setting strips add so much. 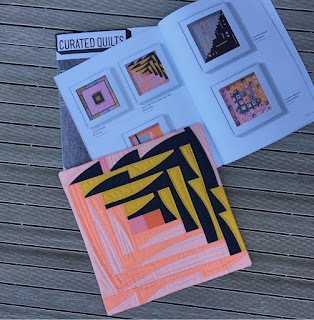 Beth created a wonderful balance grouping her blocks to make the secondary pattern and the neutral grey border enhances the brights with an illusion of floating. 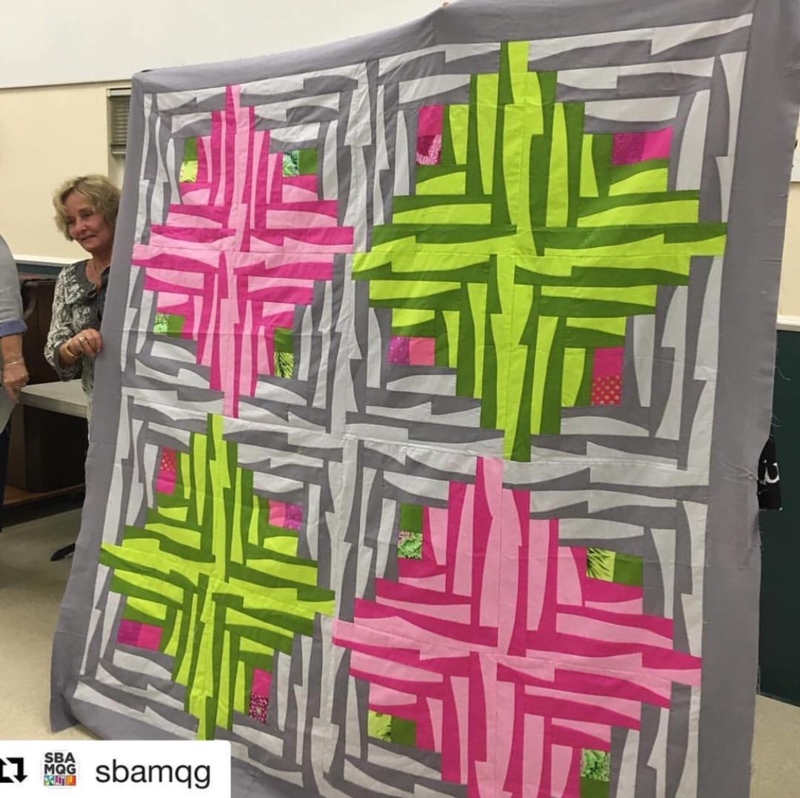 I knew I could count on Muriel to make something amazing again and in record time sharing this FINISHED quilt less than 2 weeks after class. 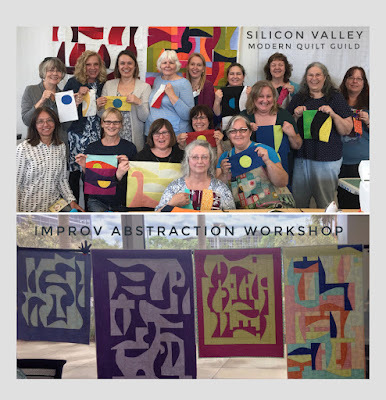 She attended my Improv Abstraction - Playing with Parts and Possibilities workshop last year and has the best attitude and color sense. 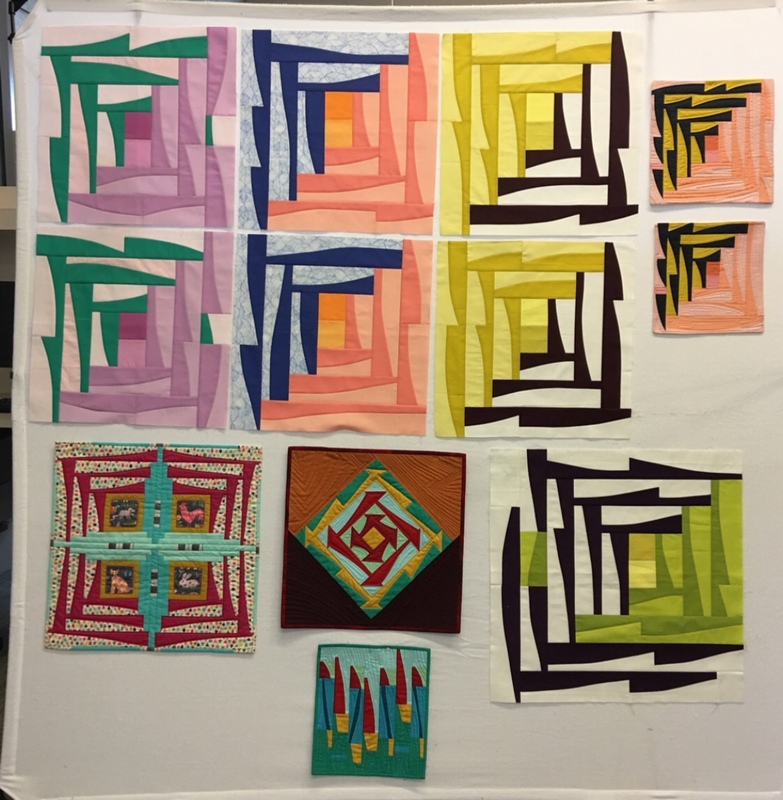 I brought samples of 18" blocks as well as minis that were made with the Improv Abstraction shape and talked about my design process which I love to do. 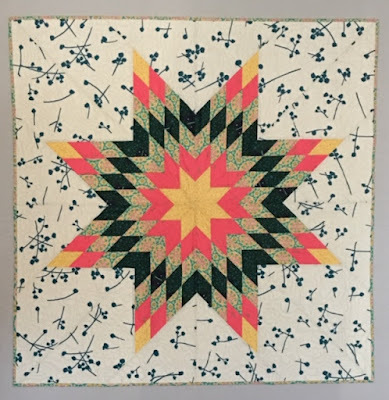 The finished quilt that I shared was this - yet to be named one shown here. The Log Cabin may be less obvious but I wanted to illustrate the versatility of the gentle curve and classic assembly. 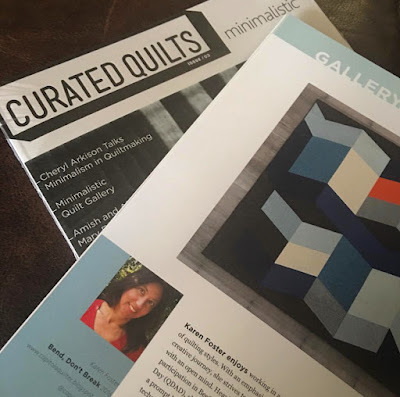 Our MQG chapter has once again been invited to have a small group exhibit in the local Quilt Show put on by Pajaro Valley Quilt Association PVQA which I am also a member of. 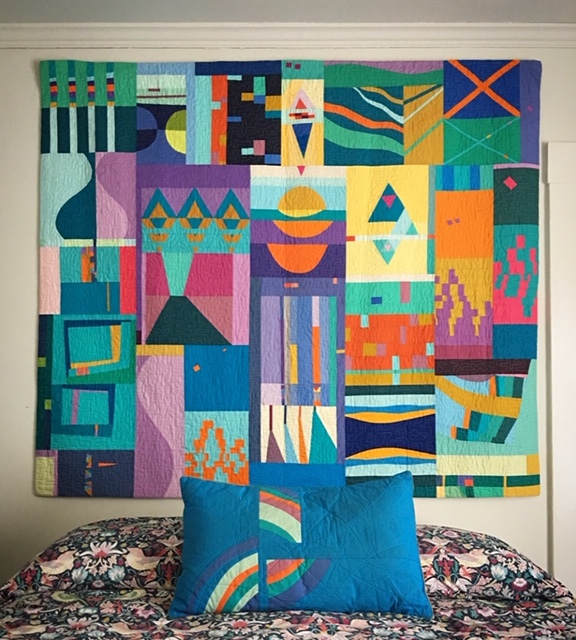 Rather than a specific theme or challenge we are able to choose any quilt that represents modern and our personal aesthetics, so I've picked this one. Detailed blog post HERE. I hadn't realized until filling out the form however that it was not yet given a name. Suggestion on Instagram crowd sourcing lean towards either a sea based Surf/Kayake/Canoe theme or more regal one referencing Castles and Coat of Arms. To me it has a bit of an Art Nouveau or View from Above vibe. What do you think??? 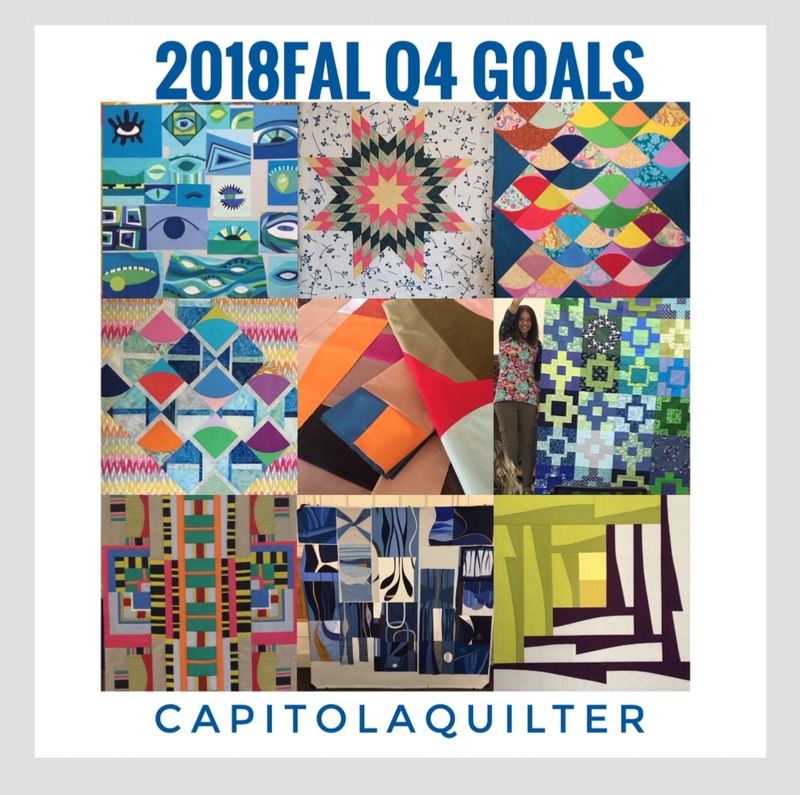 I'm pleased to say that I get to check off a finish on my Q4 FAL goal list and link up to Amanda Jean's Crazy Mom Quilts Finish It Up Friday party. 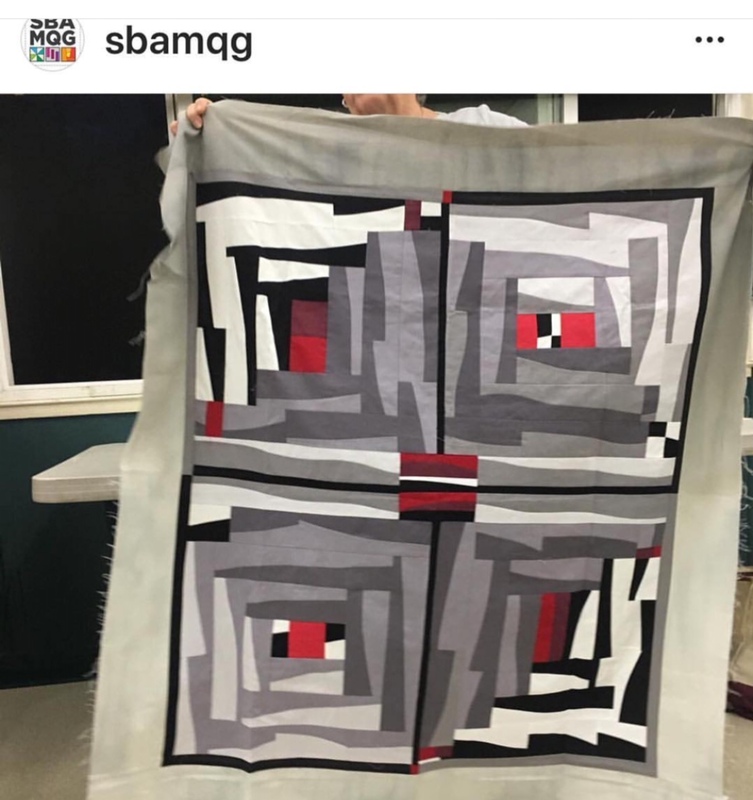 If you follow me on Instagram, you know that I did a bit of crowd sourcing of opinions as I was auditioning fabric choices to prepare for the September workshop at Back Porch Fabric in Pacific Grove. I also had my favorite personal assistant chiming in and mocking up her ideas on what to do. Continually impressed by the genuine interest and scissor skills of my adorable granddaughter. 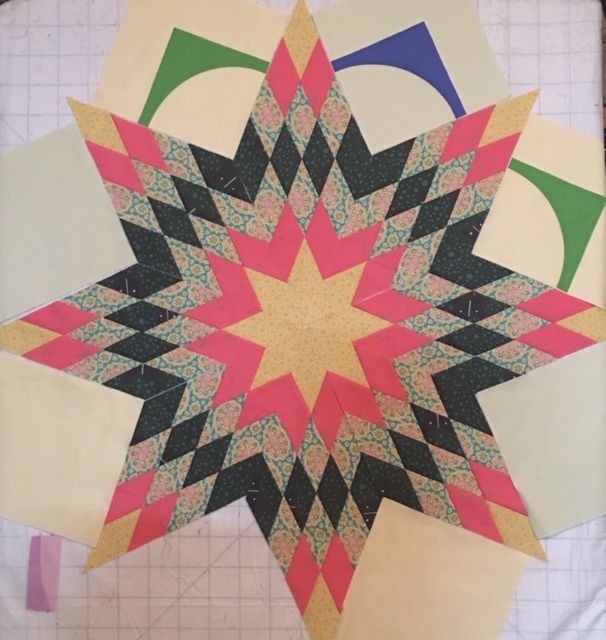 I used an app on my phone to get a better visual on the pattern repeat which helped make the final decision of color placement. Amazing how different they are with a slight change here or there. Without one right answer, it was hard to choose. 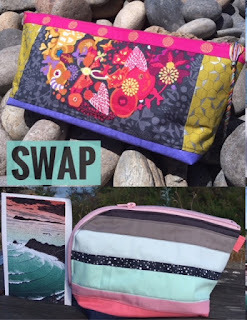 Mixing modern and traditional fabrics - all from stash was a bonus. 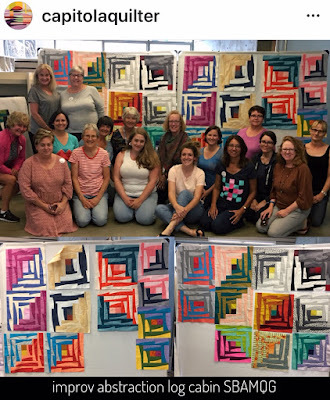 Sharon Winters was a wonderful instructor and I would definitely take another class from her. We brought the pre-cut strips and powered through the process smoothly. I finished up at home and within the next three days had myself a top. 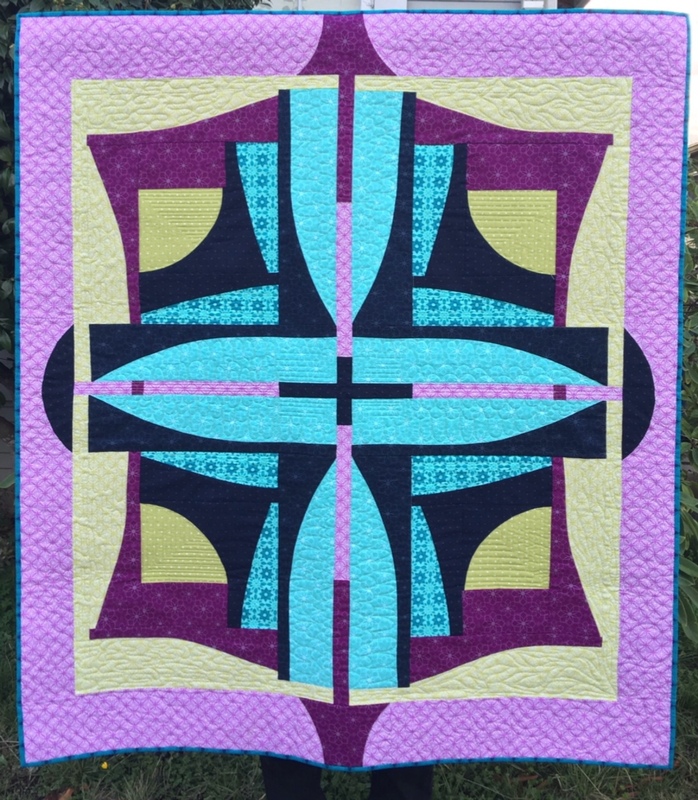 Because this was to be a baby quilt for my expectant niece due in December, I knew I'd get done. 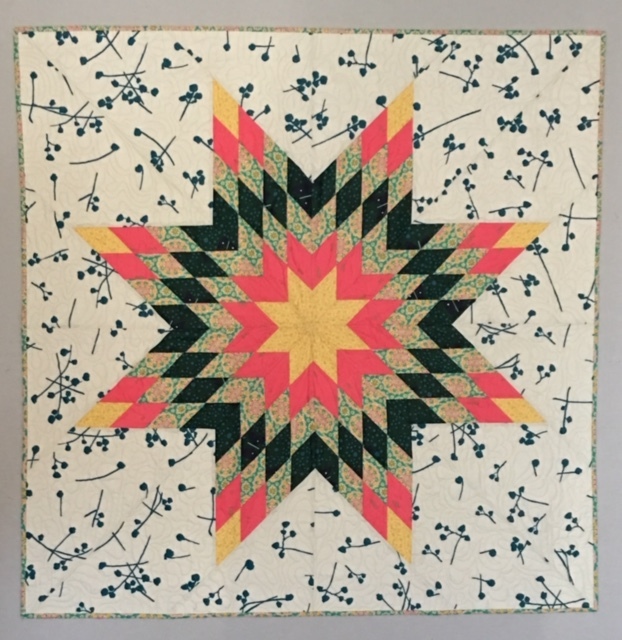 The ideal size, I opted to float the star rather than include a border. Because the background fabric was non-directional and super forgiving when it came to the joints showing, rather than Y-seam I tried out setting triangles instead. Pleased with the results I may use this method again. 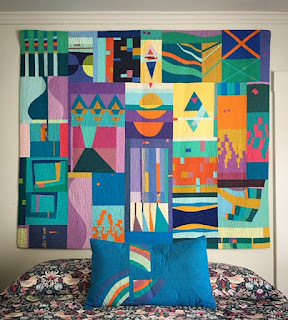 Lucky for me, my friend Pat offered up use of her long arm and I had a bit of whimsical play with the quilting. The butterflies and flowers on the backing gave it just the right amount of "baby" and I got to use one of my favorite prints for the binding, hand stitching it down with love. 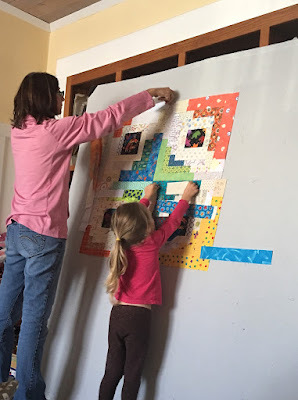 Without a proper photo shoot, the portable design wall was a good alternative. I was able to gift it in person which always makes me happy. 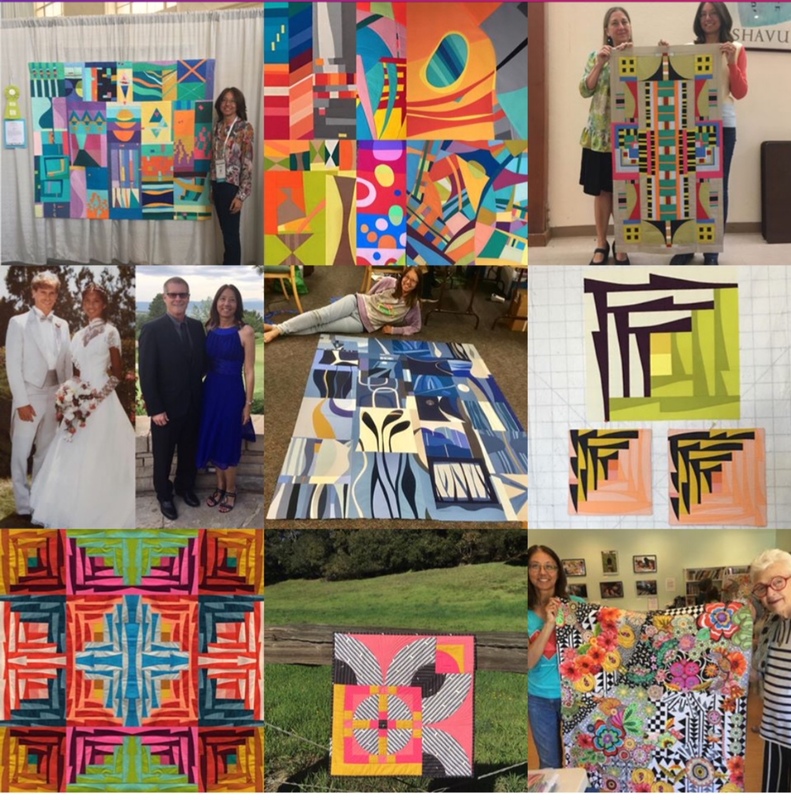 Precision piecing and traditional patterns have become sort of rare in my recent makes but I'm glad that I continue to go where I want to go with my style and embrace a broad definition of my quilty voice. 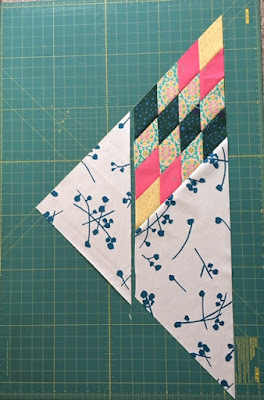 With that said - It was challenging to stay the course and not bounce around too much with my tendency to tweak a pattern. Above is one of the ideas that I decided not to do for this particular project but would like to explore further. I love the secondary pattern and think it has great potential. (ignore the blue/green colors - they are what I had on hand to test out the concept). Wishing you all well - thanks for checking in.